Two silverback gorillas; probably the original source of a human malaria parasite. Photo credit: Patrick Cyusa used under CCO license. Malaria-causing parasites have had a deadly impact on human populations for a very long time. Ancient texts found in China describe malaria infections and our genome bears the evidence of dealing with malaria, for instance in the form of the sickle cell anaemia mutation, which is maintained in the population because it offers some protection against malaria. Still today, malaria will kill up to 500 000 people a year and, as yet, there is no commercially available vaccine to protect us. Malaria is arguably one of the worst parasitic disease to affect human kind and there is a total of five species of malaria parasite that cause it in humans. With such a large impact, researchers have always sought to know where these parasites came from. When human and chimp lineages split from a common ancestor, did malaria parasites infecting that common ancestor also diverge, leading to human malaria species and chimp malaria species? This was long thought to be the case for the species of malaria-causing parasite Plasmodium falciparum, which, along with Plasmodium vivax is responsible for the majority of human malaria cases and deaths. The prevailing theory on the origins of Plasmodium vivax, however, is that it is much younger, having jumped into humans from a macaque monkey in southeast Asia around 60 000 years ago. If these theories are incorrect researchers need to find the true origins of malaria parasites that infect humans in order to assess the risks of future cross-species transmission of malaria parasites from monkeys and apes to us. This information also gives us important clues as to how to treat and manage the infection. Now, new developments in genome sequencing technology have flipped the script of the malaria-origin story. If you want to know how a group of organisms evolved and split into different species, the best method is to look at changes in the DNA over time, across all the organisms in question. This type of analysis gives us the phylogeny, or evolutionary tree, of the group and can estimate which lineages of species gave rise to the others and so on. The more species and sections of DNA one looks at, the more relationships and information will be available. This is exactly what has been done with malaria parasites. Our ability to collect malaria DNA from apes was traditionally limited by the need to draw blood from these animals. Technological advances in the last decade now mean malaria DNA can be collected and isolated from ape faeces, opening up the possibility that a huge number of samples can be sequenced and results added to data used to construct the phylogeny of malaria parasites. As it turns out, apes are carrying many more malaria species than originally thought, and it was this new data that provided the first hints that human infections with P. falciparum may have originated from extant apes. Earlier this year Dorothy Loy and group of colleagues published an excellent review of these findings. Among the 3500 sequences sampled, six Laverania species (a subgenus of the Plasmodium genus) were identified. One lineage from western gorillas was nearly identical to P. falciparum. Initial thoughts were that these infections provide a clue that human malaria could infect gorillas until more analysis showed that, in fact, human P. falciparum is actually a descendant of this gorilla species. Arguably this deadly human parasite did not coevolve with early humans when they split from our chimpanzee common ancestor, rather it jumped to humans from gorillas in a single transmission event roughly 10, 000 years ago. This new insight into malaria origins also helps to explain why P. falciparum has surprisingly low levels of genetic diversity compared with other malaria species. Originally only a small number of P. falciparum parasites jumped into humans as only they had the correct set of mutations that allowed them to survive. Currently, no gorilla malaria species seem able to survive in humans. Because only a small number of unique parasites were able to infect humans, this population has less diversity than the full range of parasites in its original population, a situation known as a population bottleneck. By understanding the average amount of genetic change in malaria genomes over time and the number of differences between P. falciparum and the gorilla malaria species researchers were able to estimate that this switch happened only 10 000 years ago. This new understanding of the origin of P. falciparum was not the only new finding. The theory that P. vivax originated in Asia, after jumping from macaques to humans, has always presented difficulties resolving two questions. First, humans only entered into Asia 60 000 years ago and the split between macaque malaria and P. vivax appears to be much older than that. Second, the Duffy-negative phenotype which, is present in high numbers in sub-Saharan Africa and not southeast Asia, is believed to have been selected in response to high selection pressure from P. vivax, as absence of the Duffy antigen is thought to make it difficult for P. vivax to invade red blood cells. Both these issues are resolved using a theory generated from the new sampling and phylogenies. 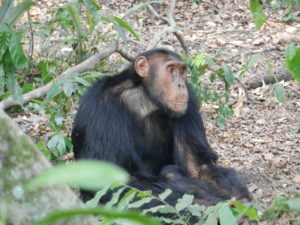 We now see that P. vivax and related strains are very common in chimps and gorillas, demonstrating that P. vivax, like P. falciparum, most likely has its origins in African apes and also jumped to humans in Africa. The rewriting of theories concerning the origin of these human malarias is an important revision as it could open up new and important avenues of malaria research. What genes and mutations allowed malaria to jump from apes to humans? Finding these may open up new drug targets or treatment options. Similarly, which genes are similar in both human and ape malaria parasites? Might these indicate some broadly conserved important functions that could make for vaccine or drug targets as well? A lot of dollars and effort have been poured into research into malaria parasites since their discovery only just over 100 years ago, and rightly so considering the huge economic and social costs it has on human populations. The identification of the origins of human malaria parasites is an important result that will hopefully lead to improvements in the lives of those living in malaria affected regions of our planet.